I have made my nephew a variety of felt food for his Christmas present (he will be just 2 years old). 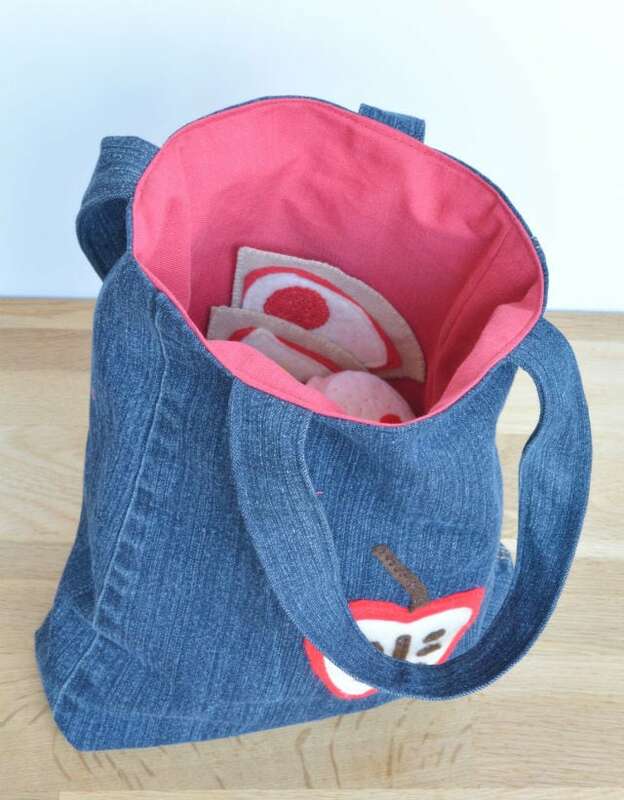 Today’s tutorial is to create the toddler bag to keep them in, go pretend shopping with, anything a two year olds imagination stretches to! 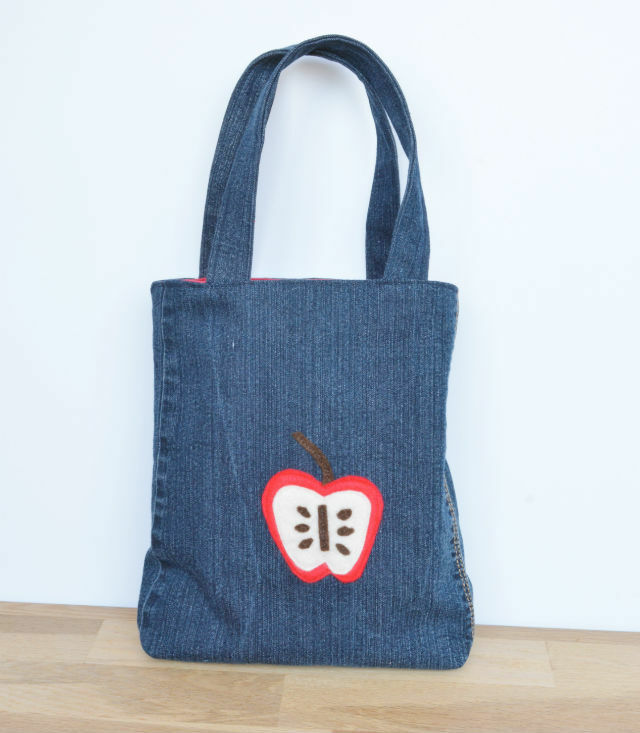 I have utilised an old pair of jeans, an old curtain and some felt to create the perfect sized upcycled toddler bag. 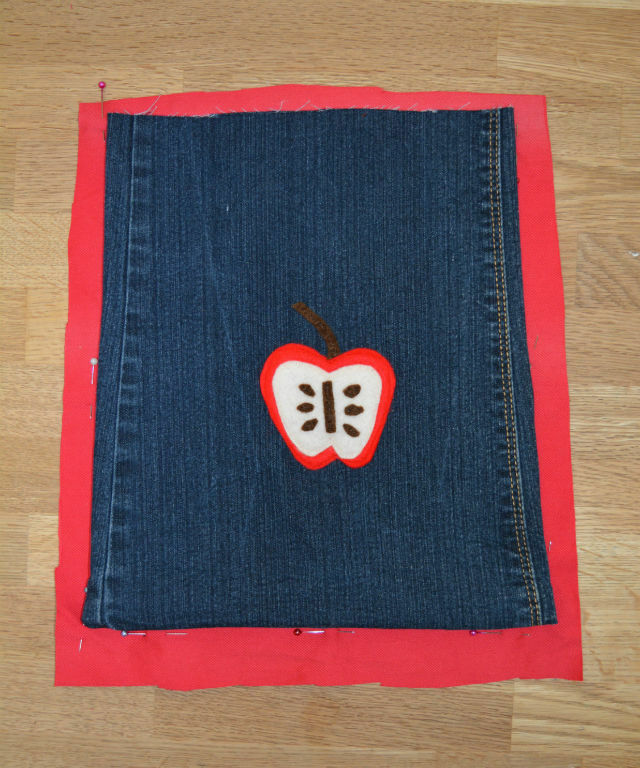 Cut out your felt to create an applique shape – I created an apple to represent the play food. If you are stuck for ideas carry out an internet search for an applique image of your chosen subject). 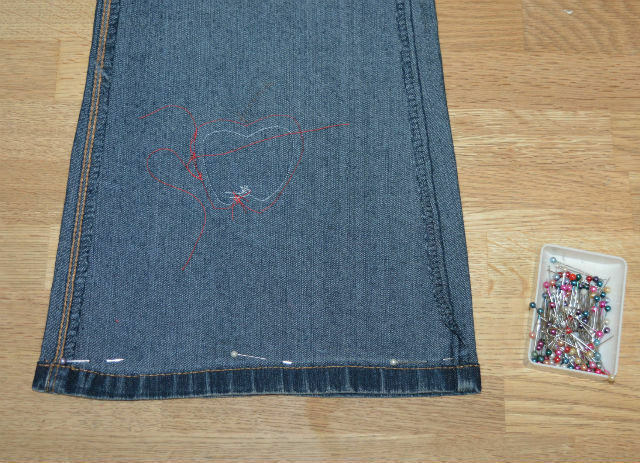 Stitch your applique design to the center of your denim. 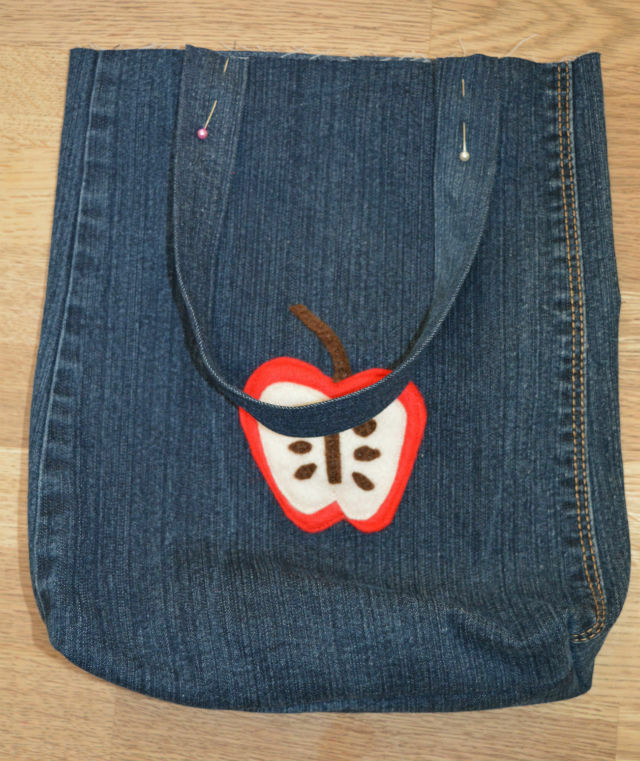 Turn your denim inside out, and stitch along the bottom of your bag. Turn to the right side out and lay on top of your lining fabric (two layers). 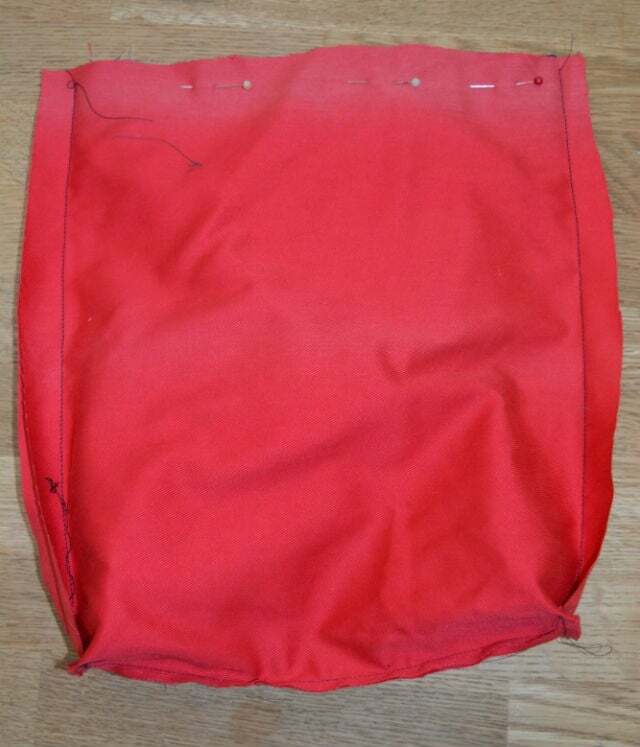 Use your bag as template to cut out the liner, including seam allowance. Stitch three sides of the lining to create the same shaped bag. Returning to your denim bag turn inside out. Mark the sides of the bag with a pin. 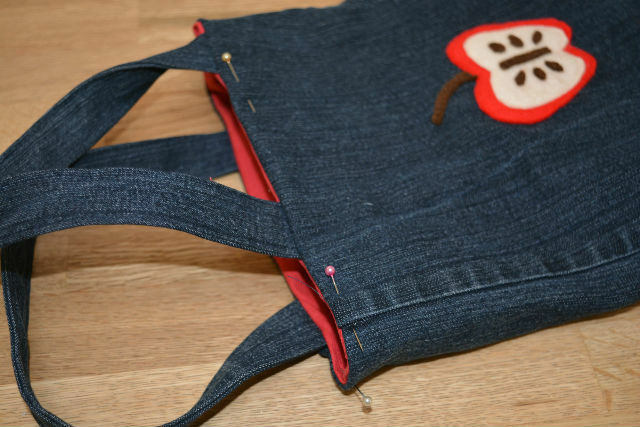 Fold the side down to the base of the bag, to create a triangular shape. Mark across a stitch line, 5cm across. Stitch across, trim and finish with a zigzag stitch. Repeat for your bag lining. 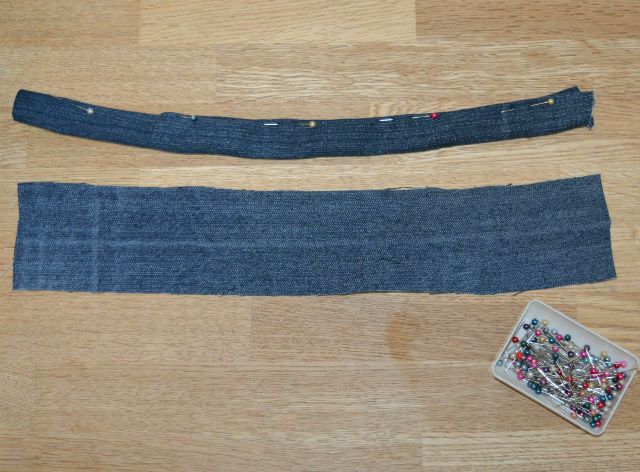 Create the handles by cutting out two strips of denim 37 by 7cm. Fold in the long edges and then fold in half. Stitch both sides of handles. 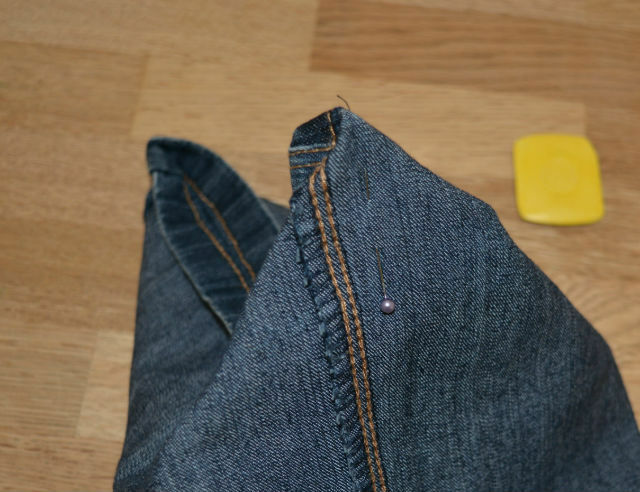 Pin on the right side your denim bag, in from the sides. Pull you lining bag over the top, right sides facing. Ensure your handles are lying neatly down the bag. 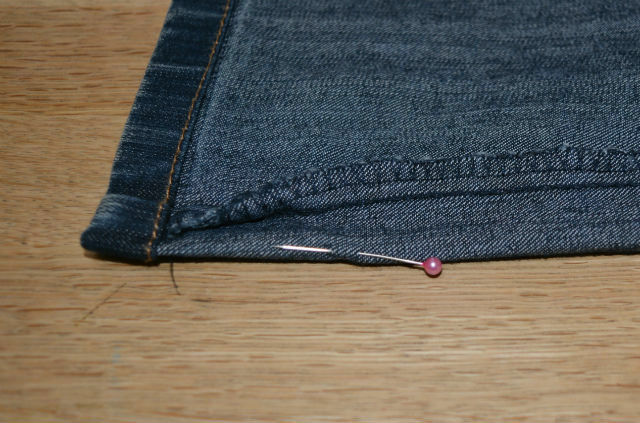 Pin along the top edge. 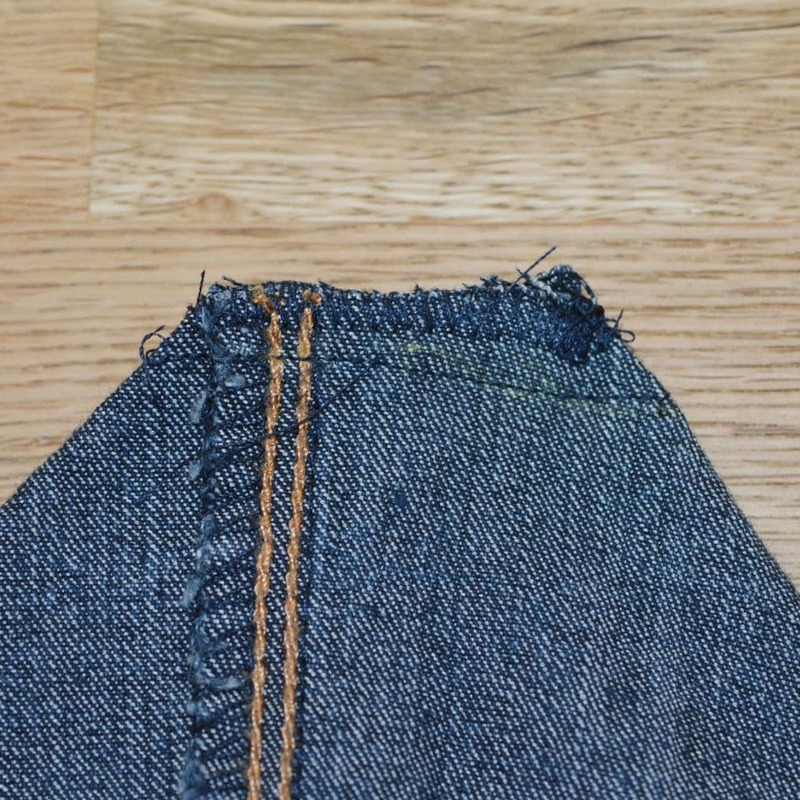 Stitch round leaving a 4″ gap in order to turn the bag right side out. Turn right side out. 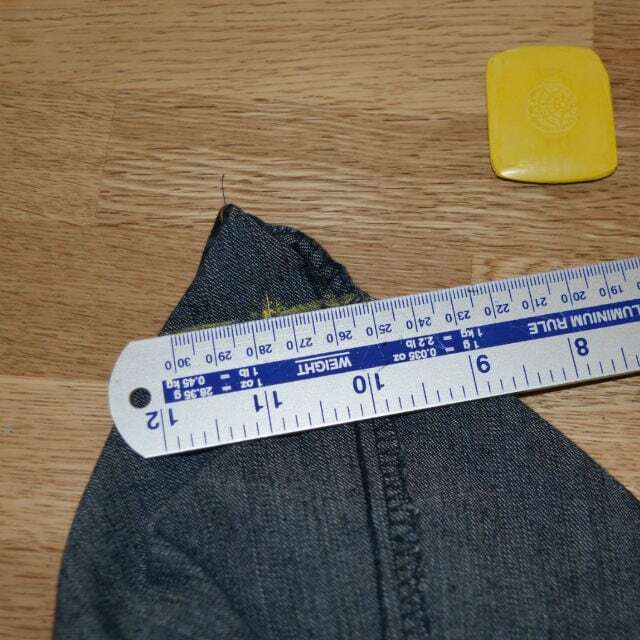 Fold in raw edge and top stitch round the top of the bag. What gifts are you making for this christmas – I love making for others, especially when it is a thrifty make! "How to make a felt christmas stocking"
Your tutorial is fantastic Vicky and little bag is so cute. I love the apple design on the front and I’m sure your nephew will be thrilled. I can imagine it going out on shopping trips. A fabulous way to reuse denim jeans, Vicky. Our kids used bags like this when they were little and they had so many uses. They used them for their own shopping bags when out and pretend shopping bags when home. 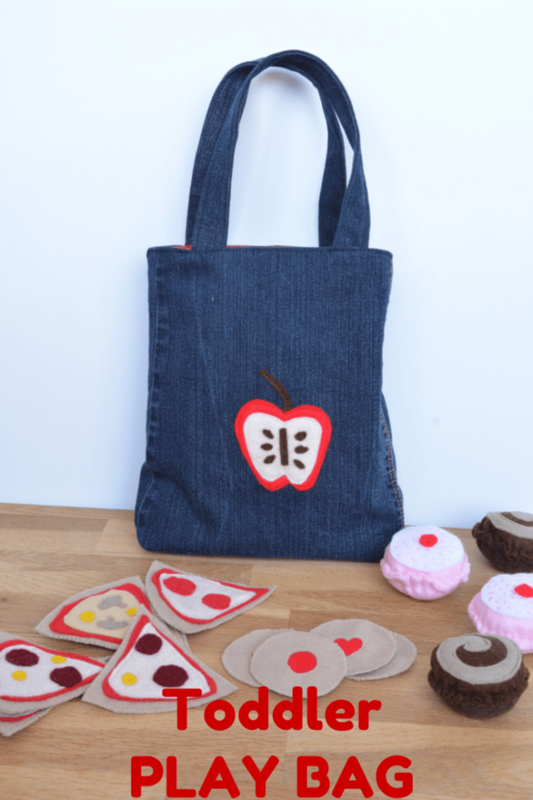 Great idea to use the bag for felt food. 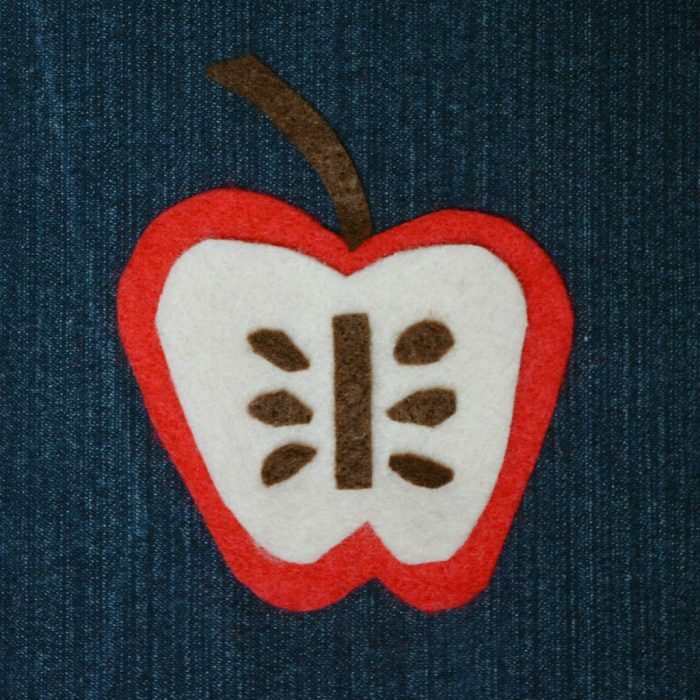 Such a cute idea, and your little apple is lovely. I love how hard wearing denim is for bags. 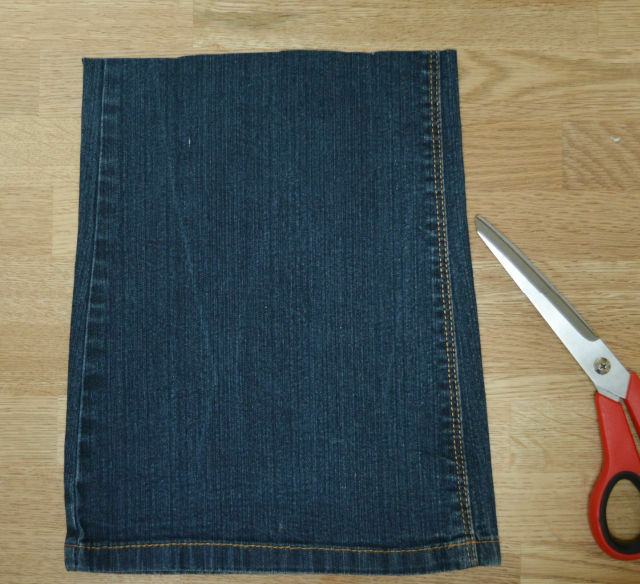 A fabulous tutorial and a really great way to reuse old jeans. 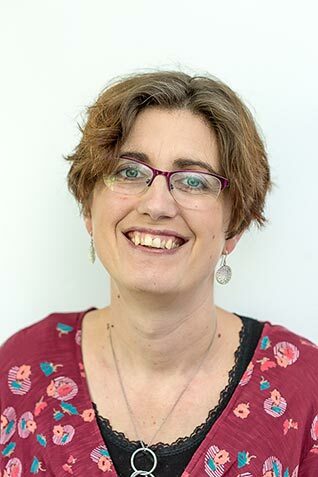 Lucy Blossom recently posted…Packaging, how important is it to you?